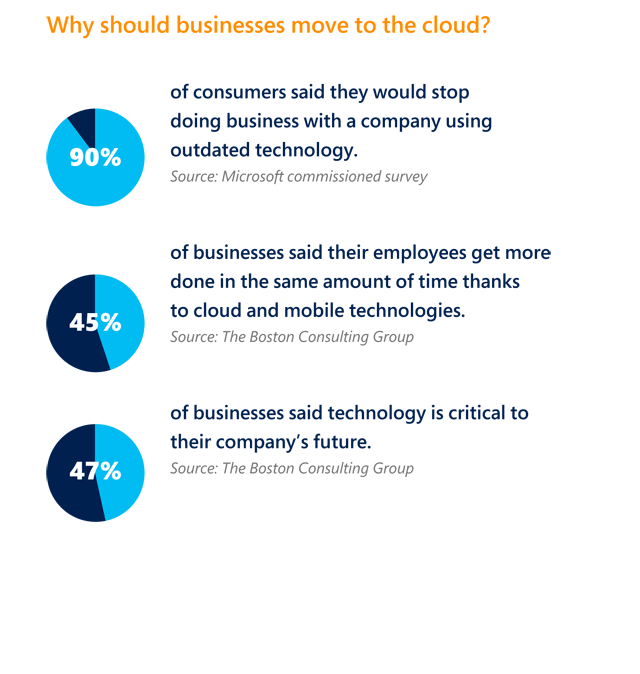 Businesses of all sizes are making the move to the cloud to modernize their technology platform, gain overall system efficiency, and enable their teams to stay connected to the data they need in order to meet customer demands from virtually anywhere. While the business benefits of moving technology to the cloud are clear, some of the technical jargon that surrounds cloud computing can be confusing. Here are a few terms that will increase your cloud IQ and help you understand the various options for deploying your solution in the cloud. SaaS—software as a service. Specific applications delivered through the cloud, typically for scenarios such as email, office productivity, customer relationship management, marketing analytics, and so on. IaaS—infrastructure as a service. IaaS enables businesses to move their entire datacenter, including storage, servers, and software, to the cloud, essentially outsourcing management, security, and maintenance to the cloud provider. PaaS—platform as a service. PaaS provides a complete operating system environment in the cloud where customers can develop and deploy software, applications, and services. The advantage is that PaaS systems scale seamlessly to provide consistent quality of service. Virtualization. Virtualization creates a layer of abstraction between hardware and software, enabling entire datacenters full of servers and microprocessors to operate as a shared pool of resources. Public cloud. Public cloud refers to services offered to multiple users (or “tenants”) in a single datacenter. Private cloud. Private cloud is a dedicated datacenter or server environment to deliver cloud services for a single customer or tenant. Hybrid cloud. Hybrid cloud is an enterprise IT environment combining some private cloud services, some public cloud services, and some on-premises computing resources.